The first thing I want you to know is that, whatever the world may think, we are not judging you. 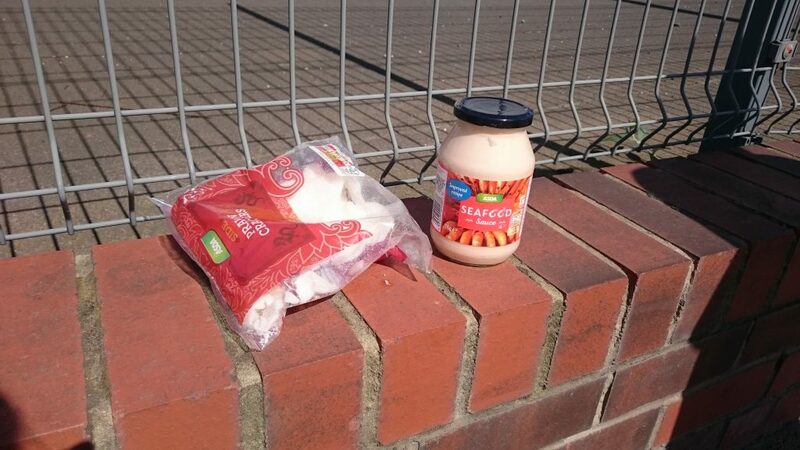 You may have chosen to leave your seafood sauce out in the hot August sun, why wouldn’t you? It’s your sauce. If your hob isn’t work properly then leaving it outside for nature to warm it up is a great idea. It saves money and is environmentally friendly. We admire what you’re doing and, boy, are we impressed! The only questionable aspect of this whole affair though is that you may have left it out and forgotten about it, given that the sell-by date was several months ago. Perhaps you forgot where you left it and bought a replacement when you’re stomach started growling. Nobody is pointing fingers. We deal with facts here, not speculation. We are not talking about you behind your back in hushed tones, far from it. Only, let’s have a little more foresight the next time you decide something is a good idea. We’re only thinking about you. And your prawn crackers. You might not be pointing fingers but I’ve decided that I am. I’m up here on my high horse and I’m getting a right judge on. That seafood sauce looks like it was rank even when it was fresh. Whoever bought it needs to be stopped. Are you saying that whomever did this should definitely check themselves before the inevitable wrecking occurs? I am. I also fear that they be illin’, because the likelihood that they are chillin’ after a mouthful of luminous pink seafood sauce is slim. How astute. There is a definite possibility that is entirely correct. Was it your sauce? It was not my sauce, sir. I am merely very astute when it comes to looking at nauseatingly-coloured foods and deciding they would make me gip. Is this the first time someone has accused you of being the owner of some sauce? No. I was accused of having some brown sauce back in 2011, and on that occasion the allegation proved to be true. I did own some brown sauce at that time. Did you chin the person who accused you? You’re always decking people, Chris, you’re so violent. No, but I spurned them. I spurned them good. It’s so unlike you to take a non-violent approach. Were the police watching you closely that year? Yeah. I was under surveillance. That guy in the trench coat was everywhere I went, which was embarassing that time I had the squits in a very small toilet cubicle. He had to pass me the toilet roll. Top remembering bants. Twenty points.